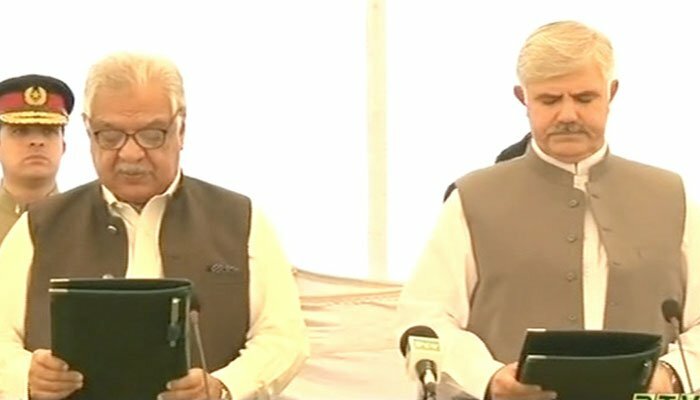 PESHAWAR: Newly-elected Chief Minister of Khyber Pakhtunkhwa, Mehmood Khan took oath of his office on Friday at the Governor’s House. KP Governor Iqbal Zafar Jhagra administered the oath to Khan. On Wednesday, the PTI had grabbed the speaker and deputy speaker’s slots while the party’s nominee Mahmood Khan — former provincial minister for sports — was elected comfortably as the 22nd Leader of the House on Thursday. The chief minister was elected through the division of the house system. All MPAs who supported Mian Nisar Gul’s candidature was asked to move to Lobby 1, while all in support of Mahmood Khan were asked to move to Lobby 2 of the KP Assembly building. The 46-year-old has previously held the portfolio of sports, culture and irrigation in the province. He was also given the portfolio of KP home minister but was later removed from the post.